For all the cake bakers and cooks, KitchenAid Artisan 5-Quart Stand Mixer is one of the best kitchen stand mixer you must have. 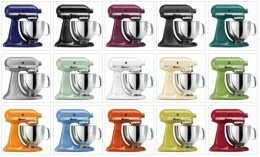 A 325-Watt Artisan Mixer with 10 different speeds available and a 5-quart stainless steel bowl. With such a beautiful kitchen equipment, anyone would fall in love for this incredible mixer for a whole bunch of great reasons.